Living in a multicultural area in America you would think I’d get swallowed up by the different cultures and languages surrounding me. Well you would be wrong! I knew I was Tibetan the first time I shouted slogans and went to protests. Tibetan protests for a little girl (eight years old) were exciting! I knew I would see all my friends and we’d even be allowed to shout at people. On the day of a protest, my family would get ready; My poor Ama-la was forced to run around and help put our chupas on. First would be my sister, the eldest so while my mom was busy with her, my two younger siblings and I would run around and play. Then of course it was my turn and on and on until all four of us were spitting images of innocent (ahem zema/zikpo) Tibetan kids. My Pala, the community leader in those days, would be too busy talking on the phone organizing everything, and when it was time to get in our family van, he would acknowledge us by inspecting us, one by one. After he approved each of us, we would climb into the van and head to the protest area. All I thought about was seeing and meeting Tibetan kids and playing with them. I didn’t see much of them, only during Sunday school. So it was a luxury to see them outside of that. I went to an elementary school that was diverse but my siblings and I were the only Tibetans. In my class I was the only Tibetan and believe it or not I was an extremely shy girl. Yes I was shy, no one believes it, but I was. I disliked standing out and being an only Tibetan with a unique weird name made me stand out, which embarrassed and annoyed me. The teachers would always get my name wrong and I was forced to get up in front of everyone and while they stared had to correctly pronounce my name – which the teachers still got wrong. However, when it was time to protest, all my shyness went away. When we would get to a protest, all the adults would be running around with food and signs that said “Free Tibet!” and “Long Live His Holiness the Dalai Lama!” When Injis get ready to do something active they pull out their water and nutrition bars (small snacks). Us Tibetans will get ready with bhoeja, ja-ngamu, dreysil, and palay; yes we need all of that! Spotting a group of our friends playing, we would approach them and easily join in on the game. With no language barrier it was easy to communicate with them and play the games we all used to play in India. Then one of the adults would come over and place those huge signs around our necks. I mean huge enough that it would cover most of our bodies! We all were shuffled into the front of the line, I guess the adults thought if people saw a bunch of innocent little Tibetans shouting for Rangzen, we’d get more sympathy. We’d start our march and would follow the lead slogan shouter. Inji’s would be staring at us with curiosity. My usual shyness and embarrassment was nonexistent in those moments. They weren’t just looking at me, they were looking at all of us. I wasn’t alone, I was with the rest of my Bhoepa community shouting “I am Tibetan,” “Tibet for Tibetans,” “Long live His Holiness the Dalai Lama” and my favorite “China, China, China, OUT, OUT, OUT”. Walking side by side with my community, I felt like we all had each others backs. 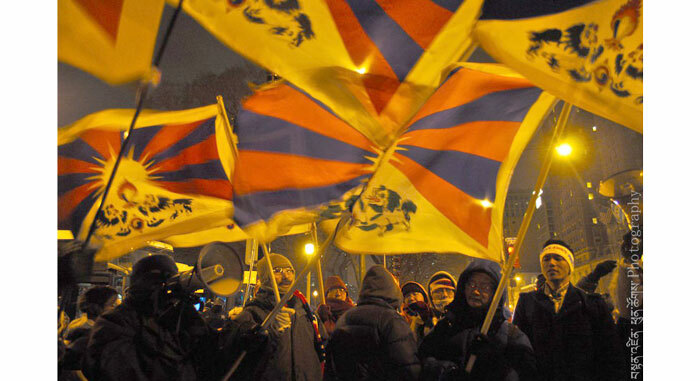 With that knowledge my voice got louder, my head raised higher, my mini Tibetan flags waved faster. I would get so confident that I even lead some of the chantings. As we marched, my confidence turned into cockiness so I would have this menacing look, and I would literally stare down people passing by, challenging them to tell me we’re wrong. In those moments I felt fearless, confident, and right. I found my identity in that unity. I found my voice amongst them. After shouting our lungs off we’d all go home with our voices gone. The next day in school I was content; no need to correct my teachers today on how to pronounce my name (which they got wrong anyway) or worry about trying to speak English correctly because I had no voice! I was left alone to daydream about our next protest when I would again be in the front lines, ready with my Tibetan flags in both hands, my huge sign around my neck, my slogans ready, and my people alongside me ready to stare down anyone who would challenge us! Yup we were Gangsta! Bhoepa Gangsta! TAH TAH TAH, T-UNIT!